Welcome to the Herbal Farm! Welcome to The Herbal Farm website. We hope to help you benefit from the wonderful healing properties of plants as well as guide you to using them safely and effectively. 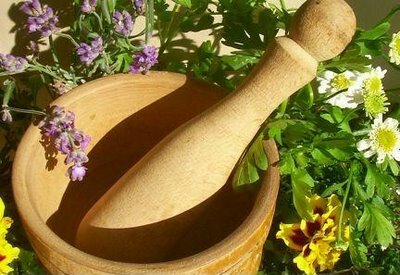 Herbal medicine is one of the most time-tested human traditions on the face of the Earth. Herbal medicine has benefited millions of people for thousands of years. Health is a gift that makes life worthwhile. Herbs can certainly help us along that path, but they should not be relied upon simply as a band-aid to fix a health problem. We encourage you to look deeply at the causes of illness and seek to live a healthier lifestyle whenever possible. This includes having healthy relationships, eating a wholesome diet, and exercising. We must also avoid the things that damage health, such as stress, smoking, exposure to pollutants, and an unhealthy lifestyle. Provided in this website is information on how to use herbs, as well as herbal blends. Each herbal description includes contraindictions, such as dangerous side effects, to which you should pay careful attention. Many of the contraindications only occur in extremely large doses and would never be a problem with normal use. However, there are some plants that should best be used with professional counsel, and many should be avoided during pregnancy. In listing contraindications. Remember – just because something is from a plant does not mean it is appropriate for everyone to use at all times. In Chinese medicine, different foods have different characteristics, described as energetics. We must admit that not everyone agrees on whether an herb is cool, cold or warm. As American herbalism evolves the use of energetics will become a more genuine and accurate part of our own healing tradition, with more agreement between herbal practitioners. Even though some of the constituents of the plants are listed, herbalists usually prefer to use plants in a more whole form. We firmly believe that using the entire herb, with all of its components, is more effective and often safer than using any one component. Parts Used: Peel from unsprayed oranges. Properties: Antibacterial, Antifungal, Aromatic, Bitter Tonic, Carminative, Cholagogue, Diuretic, Digestive Tonic, Expectorant, Sedative, Stomach Tonic, Tonic. Internal Applications: Tea, Tincture, Capsules. All species help move chi stagnation. Although all species share certain properties, there are some differences; Mandarin Orange Peel is an anti-inflammatory, cholagogue, carminative, diuretic and tonic, and the green or unripe orange peel is a cholagogue and carminative. The bitter Orange Peel moves chi stagnation and is a carminative, stimulant, stomachic, expectorant and tonic. Additionally, different species/parts have different uses. Mandarin Orange Peel - catarrh, chest congestion, gas, indigestion; Green or Unripe Citrus Peel -- abscess, bloating, breast cancer, gall bladder congestion, liver stagnation; Bitter Orange Peel - flatulence, indigestion, stagnation in the digestive tract, tumors. Using the peels as a digestive aid stimulates the production of hydrochloric acid. The high content of bioflavonoids helps to strengthen the capillaries and tissues in the body. Orange flower water is used as a sedative. 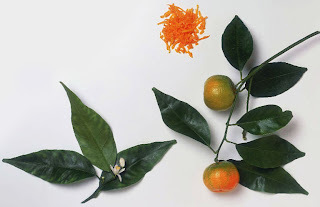 Topical Applications: Orange flower water is used for dry skin, broken capillaries and to stimulate new cell growth. Once used as a snuff for allergies. Perfumes. Culinary uses: Orange Peel is grated and added to candies, breads, cookies and cakes. It gives zest to vegetable dishes and improves the digestion of food. Orange Peel is used to improve the flavor of other medicines. Orange Peel is used in making marmalade and liqueurs such as Curaço. Fruit is eaten plain or juiced. Orange flower water is used to flavor desserts. Energetics: Pungent, Bitter, Warm, Sour, Cool, Dry. Chemical Constituents: Essential oil (limonene, pinene, linalol, humulene), flavonoids, aldehydes, coumarins, bitters, vitamin C.
Contraindications: Use Bitter Orange with caution during pregnancy as large doses may stimulate contractions. Comments: The energetics differ depending on the species, as follows: Mandarin and Bitter Orange Peel - pungent, bitter, warm, dry; Bitter Orange Peel - sour, bitter, cool, dry. Oranges are native to the Far East and China and are believed to be the Golden Apples of Mythological fame. Oranges are regarded as a symbol of fertility due to the fact that they can produce flowers and fruit at the same time. The species Citrus reticulata (Mandarin Orange, also known as Tangerine), is closely related to the species Citrus aurantium (Bitter Orange, also known as Seville Orange) and Citrus nobilis-mandarin. You need to be quite astute at research and writing. This shows up inside your original and exclusive content material. I agree together with your primary points on this topic. This content ought to be seen by much more readers. I found very informative blog when I was reading this. I was searching this kind of information since a long time. Thank you for sharing it. Are you satisfied of the herbal info mentioned in this site?